Carry a Yemenite kudu horn shofar in this elegant velvet storage bag designed by Yair Emanuel. 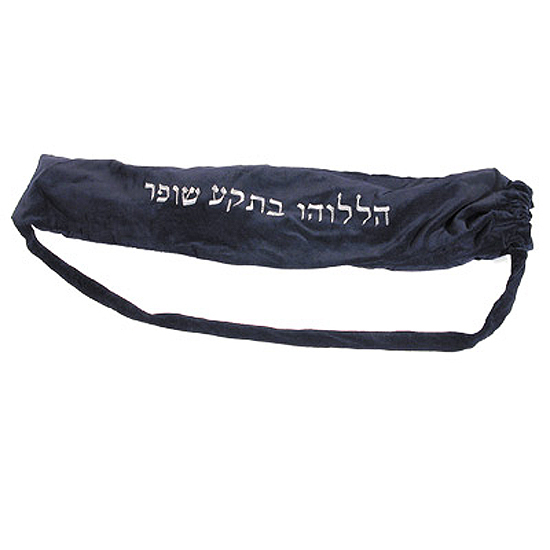 This rich velvet shofar carrying case from Judaica designer Yair Emanuel is embroidered on the side with the Hebrew words Halleluhu Beteka Shofar [Praise Him with the blasts of the Horn] and is designed to hold a long, curved Yemenite kudu horn shofar of medium length. The embroidery is worked in silver thread on a blue velvet background. The carrying bag features shoulder strap and drawstring closure. Jews of Yemen have traditionally made shofarot from the horn of a kudu (a species of antelope) rather than the more common ram's horn shofar used in other communities. According to Halacha (Jewish law), shofarot cannot be made from the horn of a cow or calf, as that might suggest worship of the Golden Calf, which is forbidden. 'Wake up from your (moral) sleep. You are asleep. Get up from your slumber. You are in a deep sleep. Search for your behavior. Become the best person you can. Remember G-d, the One Who created you.' Mishneh Torah, Laws of Repentance 3:4.